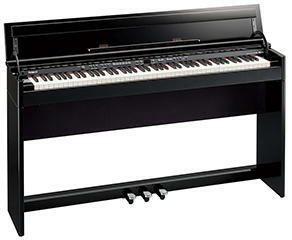 Roland updates its DP-990 digital piano line with the introduction of the DP-990R. This full-size, 88-note keyboard boasts new realism in feel and look, with Ivory Feel keys and high-gloss polished ebony finish. Playing the piano is as much about the feel as the sound, and Roland has put its PHA II Ivory Fell Keyboard with Escapement technology onto the digital piano, ensuring the lower range keys are heavier in touch than the higher ones. Each key has been sampled multiple times for a more realistic sound, and that’s complemented by a range of natural effects including reverberation and realistic resonance, emulating an acoustic grand piano. The inclusion of USB ports means it’s possible to load up digital audio into the piano and play along with it. 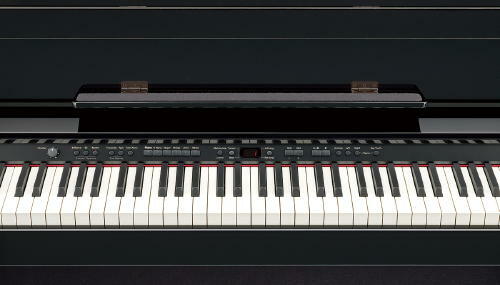 A novel additional feature is twin-piano mode which splits the keyboard in two, each half covers the same octave range. The left and right pedals can also be reassigned as damper pedals for their respective split keyboard. Nifty.